An embroidered version of the message heard all over the world on 4/16/07. Sent by the Field Hockey team of the College of William and Mary. 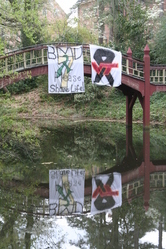 A banner hangs on a bridge at William and Mary.